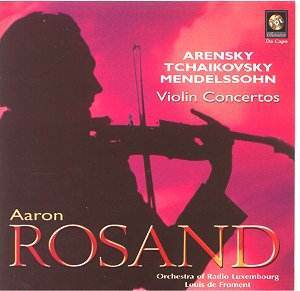 It is all down to George Mendelssohn's drive and direction that Aaron Rosand became known to tens of thousands through recordings of rare romantic era repertoire. Mendelssohn, Vox's guiding light, would surely have been pleased with this pairing of discs. Joachim, the dedicatee of the Brahms concerto, wrote the big-boned Hungarian concerto (second of three). It is a work alive with romantic character. Rosand plays it stunningly, taken up as much in the flowing quicksilver as the étincellante fireworks. He nicely catches the strutting stiff-necked gypsiness of the central movement complete with the echoes of Brahms Violin Concerto and the Hungarian Dances. This is far from being a vapid exercise. Would that other players would take the piece up. The Hubay concerto is more substantial with some truly delectable writing as at 2.40 in I and a Berliozian scamper (Symphonie Fantastique) in the scherzo, a haunted adagio straight out of a Warner Brothers film from the 1940s and a slashing and ripping finale. The Enesco prelude is all brevity, highland sentiment and Romanian temperament. The violin writing in the compact (just over 15 mins) single-movement Ernst work spills in molten warmth from bar to bar with the display leaning on the obvious Italianate influence of Paganini. The Godard Concerto is sternly vigorous, hunting and hunted in tone but, overall, light on the aural palate. The notes deny its romantic tone calling it salon music for violin and orchestra. The music seems romantic enough to me! The Ysaye Chant d'Hiver is a moving little song - sentimental and flowing sweetly. Such heart-warming writing topples over into Delian expression very easily. It matters not that the music does not appear all that wintry. The originality of the orchestral effects (e.g. the upward and downwards slides at 2.40) make this well worth hearing. A superb piece - make it the track you sample to be persuaded of the merits of this set. It is perhaps more than simple coincidence that Efrem Zimbalist senior with whom Rosand studied was himself a pupil of Ysaye. Lehár is better known for operetta and vocal music generally. It is therefore no surprise that the violin the most vocal of instruments, short of the human larynx and counterpart of the soprano voice, should attract attention. Here Lehár gypsies and Magyarises with the best in camp Christmas tree style. Hubay's name lives on because of Hejre Kati - one of those rip-roaring warhorses against which aspirant Heifetzs feel they have to test their skills and prove themselves. There is the usual slow introduction then an increasingly whirling dance off which sparks fly in welding torch profusion. Rosand takes time along the way to admire the view - perhaps shed a tear - but is also a masterful match for the flightier Hungarian stuff. Wieniawski's Concert Polonaise has that gracious balletic quality usually associated with his two concertos synthesised with Tchaikovskian atmospherics. Indeed the opening fanfare seems to be a variant of the fate motif from Tchaikovsky's Fourth Symphony. Rosand has hardly ever been out of the record collecting public's eye. Because he has been very much a Vox and Turnabout artist his name has lodged with great affection with those whose record and CD collecting began at the budget end. Rosand is however a premium artist at the budget end of the market. He has made more enduring friends for far longer than many a glistening wunderkind of the premium shelves. I first came across Rosand through his ravishing and still unmatched recording of the Sibelius Humoresques on a Turnabout LP (more of that elsewhere.. This present collection is generously timed and mixes familiar and rare. Speaking of which the Arensky is a work of slippery mercurial romance leaning deep into the territory of both Mendelssohn and the syrupy Korngold concerto without the Korngold's OTT sentimental indulgence. That said the tunes in the Arensky are not as memorably sculpted as the Korngold. The music clearly suits Rosand who is no stranger to the idiom. The only blemish on the brief Arensky is a very subtle metallic 'halo' on the solo violin. This is absent from the other two works. The other two works are well loved warhorses but there is no suggestion of tiredness in the performances which are dashing and impetuous. It does not displace my reference version (the BMG-Melodiya Oistrakh conducted by Rozhdestvensky) but the Rosand flies along with pushy élan and much freshly conceived accenting as at 2.10 in the finale. The Mendelssohn (an influence on the Arensky) is a surprisingly emotional and passionate work for 1845 - with many of the same stylistic streams as the Tchaikovsky. Rosand does not dawdle and as in the Tchaikovsky it is the impetuous rather than the reflective that carries the day. My preference is for the sumptuous Campoli recording on Beulah but this is distinctive and rewardingly listenable. Good notes and healthy 1970s sound with a natural emphasis on the soloist. There is some negligible roughness in the orchestra (e.g. horns in first movement of the Mendelssohn) but nothing to take the honey-glaze off these top-flight performances by a craftsman of the emotions. The coupling is extremely generous. Rosand's integrity stares out unblinkingly from every bar. 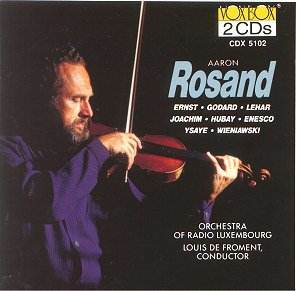 This disc represents the first of a new generation of Rosand recordings. It dates from 1998 and rather typically seems to have been ignored in most quarters. Is this down to the snobbishness which still prevails in relation to artists who have recorded for bargain labels? Whatever the rights and wrongs of the reviewing situation an artist recording these two chef d'oeuvre works is up against a plethora of world class reputations. Herman Krebbers recording on Philips is one of my favourites. 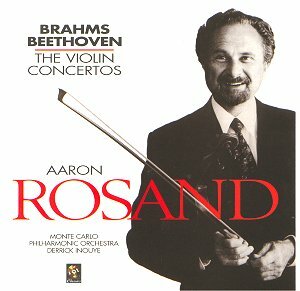 The orchestral contribution on the Vox disc is brisk and you might apply the same epithet to Rosand's approach as well. He does not however cut corners on this most spiritual of concertos - the antithesis of the repertoire with which Rosand is usually associated. 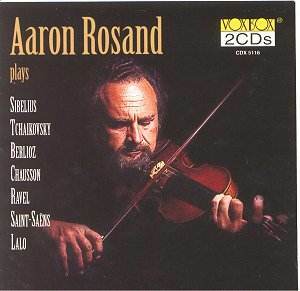 Rosand's violinistic voice is strong but slender of tone. In the boiling and bubbling rondo Rosand skims and skitters in smiling roguish charm. In the Brahms the pace seems less controversial. Rosand is in lovely form with enchanting tone and delicate pacing. He is not short of attack and there is plenty of animal excitement from both soloist and orchestra. Do I detect that the orchestra and conductor were also more engaged by this concerto than by the Beethoven - only a matter of slight shading but noticeable all the same. The concerto's finale goes with that snorting and galloping cavalier spirit that we also find in the finale of Nielsen's violin concerto. I rate this version of the concerto very highly indeed. Do hear it. The recording is not of the richest vintage. Playing time is close to the maximum. The liner notes (by Dan Tucker) are concise and in English only. Strange how fashion moves on. It has left any piece for solo instrument and orchestra having the effrontery to call itself anything other than concerto in the wasteland. Such pieces now have a life on CD alone except for the rarest concert exceptions and competitions (and then usually in a version with piano). So be it. Though it is strange that when the public is more easily captivated by the 3 minute sound-byte that these shorter pieces are not more popular in concert. These bon-bons are dispatched with affectionate zest by Rosand who plays them for every subtle turn and dexterous twist and every gramme of neon excitement. He is in total rapport with his orchestra and conductor. The recordings are all excellent given their twenty years worn lightly except for the harsh Berliox Reverie et Caprice. The Northern sun and moon play in brilliantly poetic limelight over the Sibelius Humoresques. I learnt these utterly lovable pieces from this recording when it was issued with a recording of Nielsen's Symphony No. 6 on Turnabout LP. These are the distilled quintessence of Sibelian temperament - romance in all its cool lunar intensity. The benign Tchaikovsky Serenade is done with meditative reserve. The brash edge on the solo violin in the Berlioz piece compromises what is otherwise a sentimentally doleful performance. The Saint-Saens Introduction and Rondo Capriccioso has been well done by many violinists (Ulf Hoelscher is one of my favourite recordings - EMI). Rosand turns in an exotic performance - accented balletically and not short on crackling energy bursts. In the case of the rather revolutionary Chausson Poème I have recently heard the Vadim Repin version on Teldec and prefer the richer air brought about through the plusher modern EMI recording. The Chausson is a terribly neglected work forward-looking, meditative, with touches of Delius. Hearing the Rosand again I am torn. Rosand seems to put his all into this music and it pays in dividends of eloquence. The Ravel Tzigane I first heard during the early 1970s on a Philips Universo LP played by Arthur Grumiaux - a most affecting performance more effective, I thought, in its fanciful introspection than in the flyaway acrobatics. Rosand is good in both. The second disc breaks the mould by including a work which calls itself 'concerto'. Saint-Saens' Third is a true warhorse having been much recorded by all and sundry amongst the violinistic brethren. The three Saint-Saens concertos have charm, Beethovenian gravitas (from the violin concerto, that is) and some flashy witchery but they lack the exoticism of the Caprice Andalou (would that Rosand would tackle that work! ), the Havanaise, and the Introduction and Rondo Capriccioso. Rosand matches the requirements of this work most beautifully but I do not find this concerto the most involving of pieces at the best of times lacking the very melodic distinction that marks out his second piano concerto and third symphony. It always strikes me as a work that is going through the romantic motions. The Havanaise is a different matter altogether and while I have fond memories and great affection for the Leonid Kogan version Rosand is all quiet grace, restful smiles, sprinting brilliance, sparks flying everywhere. Next time Class Fm (or its equivalent elsewhere ) wants to try a soupçon of soothing music which has true character they should reach for this track. A recording and performance to count alongside the best. You will want to play it again and again. From Havanaise it is a natural progression to move to Lalo's once ubiquitous Symphonie Espagnole. With its glaring Brahmsianisms, stock Spanishry, deep reserve of charm and mercurial mood changes it is a work still capable with small effort of winning friends. I wonder what would have happened if Lalo had just called it a concerto. By the way the Rhapsodie Norvégienne is also well worth seeking out. I remember it being coupled with the Martinon recording of the Namouna suites and making quite a splash. The Repin on Teldec is a richer recording but for the same price you can have Rosand and almost three times as much music as the Teldec offers. There is some stunning playing on offer here: stunning both in the depths of expression and in spark-striking pyrotechnics. It seems that sometime in 2000 radio tapes of Rosand with the North German Radio Orchestra will be issued on commercial CD. There should be three CDs featuring 4 or 5 concertos. Here's hoping we get some more out of the way material. Rosand is also recording the Sibelius and Khachaturian concertos with the Malaysian Philharmonic Orchestra and Kees Bakels. With the North German Radio Orchestra he is doing the Bruch Scottish Fantasy and the first two concertos. I hope that he can also be persuaded to record the Klaus Egge Concerto - which is within his performing portfolio.